Today’s specials include a report on Millennial food ordering trends, a new plant-based concept in Canada and sustainability takes center stage. Send news items of interest to Modern Restaurant Management (MRM) magazine’s Barbara Castiglia at bcastiglia@modernrestaurantmanagement.com. orderTalk, Inc. released a research report on Millennials and their tech-savvy food ordering habits and views. 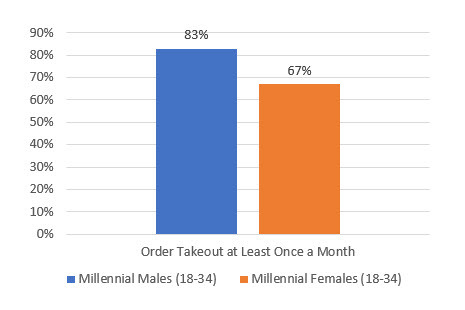 The report reveals that 79 percent of Millennials (ages 18-34) have ordered takeout via a website or app, which is 29 percent more than the older U.S. adult population (ages 45+). To support this, the survey statistics revealed that Millennials are 26 percent more likely to wish it were easier to order takeout digitally than Americans ages 45 and older (70 percent versus 44 percent). The study also reported that 69 percent of Millennials who have ordered takeout digitally have abandoned a digital order, and the most common reason was because the website/app was not functioning properly (35 percent). The research report is the result of a 2017 online survey conducted on behalf of orderTalk by Harris Poll among 2,246 U.S adults. The full 2017 orderTalk Online Ordering Usage Report can be downloaded here. Aloha Poké Co. is planning nationwide expansion with locations coming soon to Southern California, Wisconsin, Minnesota, Florida and Washington D.C., among others. Aloha Poké Co. has been packing poké bowls since March 2016 when the first location opened within the Chicago French Market. Since then, the concept has grown to have additional locations in Illinois, with aggressive expansion plans within Chicago. Earlier this year, the brand announced that it would also be expanding into Denver. Southern California poké fans will soon be able to find Aloha Poké Co. locations in Los Angeles, Marina Del Rey, Costa Mesa and San Diego. “Los Angeles is actually where we first got the inspiration to bring poké to Chicago, so to be opening multiple West Coast locations is incredibly exciting. It feels very full circle,” said co-founder Zach Friedlander. In the Midwest, Aloha Poké Co. is opening two restaurants in Milwaukee, as well as one in Minneapolis. Miami will get a larger dose of Aloha spirit, with three locations coming to the city, and Washington D.C. rounds out the initial cross-country plan with one storefront. 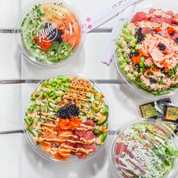 “We are so excited that poké has swept the country in such a huge way, and we’re confident that it’s more than just a trend – that people have fully integrated poké bowls into their weekly eating habits. 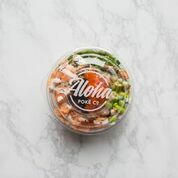 We believe that Aloha Poké Co.’s bowls are really unique, so we’re looking forward to bringing our product to so many markets and giving people more options,” added Friedlander. Chase Hospitality Group is launching its latest plant-based restaurant concept, Planta Burger in Toronto’s financial district on Tuesday, Sept. 5. The new gourmet food, quick service destination opens in space currently housed by Little Fin, scheduled to close for renovations, in the historic Dineen Building at 4 Temperance Street. A spin-off of Planta’s Yorkville location, the menu is a collaboration between chef David Lee and Chase Hospitality Group culinary director Tyler Shedden, with an emphasis on high quality, responsibly sourced ingredients. An emphasis on take-out and catering, the restaurant offers a casual dine-in experience, with barstool seating for 14 inside, and 25 on the patio. The design takes its cues from Planta in Yorkville. The Chase Hospitality Group (CHG) develops, manages and operates six Toronto’s restaurants and the historic Capitol Theatre. Restaurants include The Chase, a social destination offering upscale casual dining; The Chase Fish & Oyster, which offers quality seafood with a strong focus on sustainability and creativity; Colette Grand Café, offering modern French cuisine and featuring a stunning outdoor pavilion, and dining room; Kasa Moto, a contemporary Japanese restaurant and lounge in the heart of Yorkville. Pizza Inn honored its top franchisees at the annual Pizza Inn Convention in San Juan, Puerto Rico. The H.M. Poythress Award was presented to Steve Stancil from North Carolina. The prestigious award, named for one of Pizza Inn’s original franchisees, is given to a franchisee that has made major contributions to the brand. It is considered to be a lifetime achievement award. Stancil owns two locations in Rocky Mount, N.C.
Jamey Brown from Knoxville, Tenn., received the Griff Glover Franchisee of the Year Award, which symbolizes exemplary dedication to customer satisfaction, community service and team leadership. The Paul Turner Award was given to Keith Herrley from West Texas and is representative of a franchisee who has made a significant contribution of service to the franchisee community. Keith recently completed his term as president of the Pizza Inn Franchise Association. Keith Middleton of Brunswick, Ga., received the “Keep the Fire Burning” award, symbolic of a franchisee who consistently grows their business year-over-year. The Legacy Awards were also given to Jim Baenisch of Richland Hills, Texas, and Donny Broussard of Port Neches, Texas, who have both been franchisees with Pizza Inn for over 50 years. Pizza Inn is a subsidiary of RAVE Restaurant Group, Inc. based in Dallas. RAVE owns, franchises and supplies more than 300 Pizza Inn and Pie Five restaurants operating domestically and internationally. The Institute of Culinary Education added Chef Bill Telepan as the first-ever director of sustainability. Telepan is currently the executive chef of New York City’s restaurant, Oceana, as well as executive chef of Wellness in the Schools, a national non-profit devoted to healthy eating in public schools. Prior to Oceana, he enjoyed a 10-year run as chef-owner of the Michelin-starred NYC farm-to-table restaurant, Telepan, and he was even invited by Michelle Obama to join the Chef’s Move! to Schools task force. In this brand new role as ICE’s director of sustainability, Telepan will help develop a sustainability-focused curriculum for the next generation of chefs at ICE. In addition, he’ll work in ICE’s hydroponic garden and with local farms to source unique herbs and produce to enhance ICE students’ culinary training, and to teach students how to grow and harvest — a true farm-to-classroom education. Telepan will work with ICE’s chef instructors to implement a zero waste plan to reduce food waste in the school. In addition, he will develop a schedule of culinary demonstrations and events to showcase cooking techniques geared toward zero waste. To learn more about ICE’s sustainability initiative, click here.